Help Fight for The Future defend the Internet! Join me in the effort - go to https://www.callthefcc.com/ and use FFTF's tool to make a free call to some random mid or senior manager at the FCC. Give them your opinion about net neutrality, or the proposed ComCast merger! 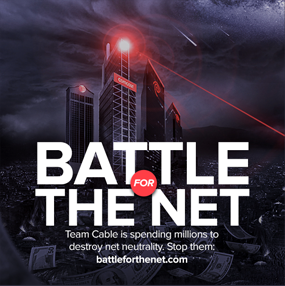 On that note - you can join me and millions of others who signed a letter to the FCC against the Comcast/Time Warner merger by going to https://www.battleforthenet.com/ and signing up. It's fast, free, and keeps you off the phone. I'm currently a Time Warner customer, and the thought of being forcible switched to CrapCast makes me want to shut off my cable completely. I can honestly say that if Comcast somehow gets the territory I live in, I will shut off my cable. Time Warner may not be the best at customer service, but they shine like a diamond compared to Comcast. Until then, I'll keep polishing the rabbit ears.